Many a time, when we want to communicate our message to a mass of people we use the presentation as our mode of communication which can be a vocal presentation or it can be in the written form.An effective presentation is one which leaves everlasting impact on the audience. 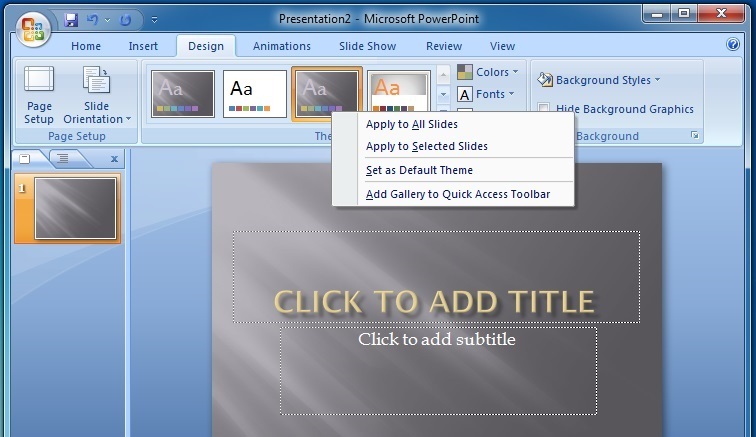 powerpoint is an application is an application which is used for creating such type of effective presentations.so, let us see how to use this application. ), a program which helps to create attractive text documents.Microsoft Word 2007 is one of the members of Microsoft Office 2007 familly. In this chapter, we are going to start with another important member of Microsoft Office 2007 family, i.e., Microsoft powerpoint 2007..
Microsoft powerpoint 2007 is a program that helps to create computer based presentation in a simple and easy way. A presentation is a systematic display of information in the form of text, graphics, sounds, movies, etc. The information in a presentation is stored in the shape of slides.slides can be considered as the individual pages of the presentation which are displayed one-by-one on the screen. 1.Click Start button on the taskbar. 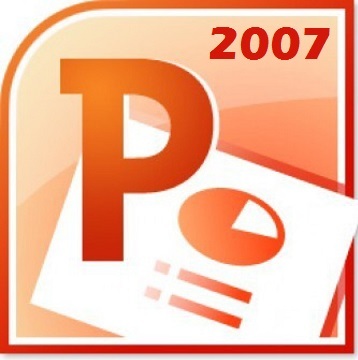 4.Click Microsoft Office Powerpoint 2007. 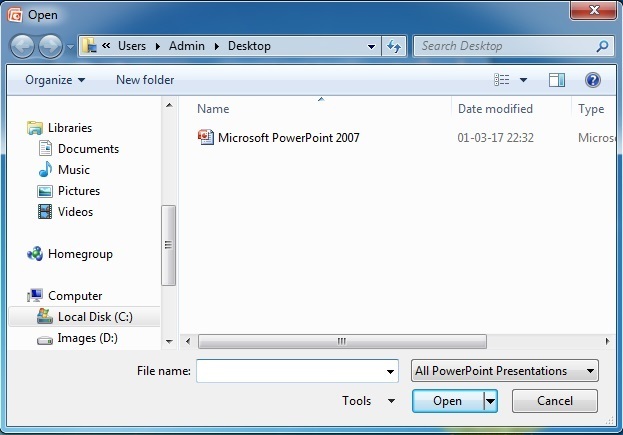 The following Powerpoint window will appear on the screen as shown below. Some Popular examples of computer presentation software are Corel Presentations, Google Docs, Openoffice.org Impress Harvard Graphics. It displays the name of file along with the program. An area where the slides are created. It is used to type speaker notes for the current slide. They are used to display the presentation in different views. It performs many functions like to create a new presentation, open an existing presentation, save and save as,print,send or close. It is located just above slide pane. it has seven tabs in it. Each tab is divided into groups. The groups are the logical collection of features designed to perform function that are used to make a presentation. It is customization toolbar that contains commands you may want to use. This is a floating toolbar that is displayed, when you select text or right click text. It contains formatting tools like Bold, Italics, Fonts, Font size, Font color, etc. 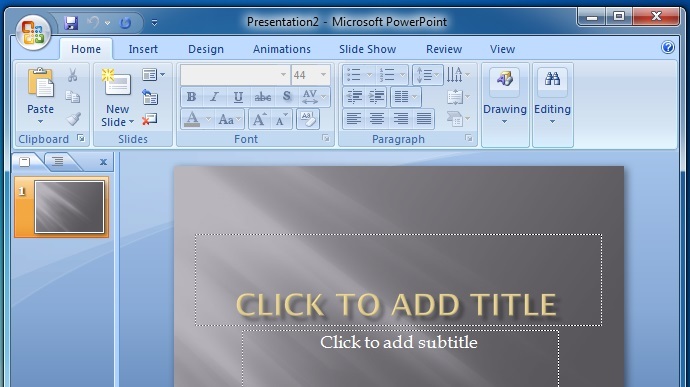 This is the normal view of power point which allows you to create, edit, format or design your presentation slides. 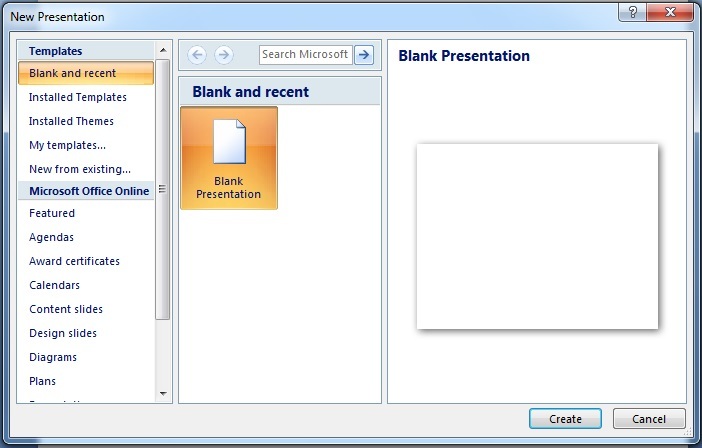 PowerPoint opens a blank presentation for you in the beginning named Presentation 1. You can change this name while saving your presentation. The first default blank slide of your presentation appears on the screen. you can use the two placeholders on this slide to type the title and subtitle of your presentation. and design suggested by power point. 3. Installed Themes:To create presentation using a design template. You can also use your existing presentation as template to create new presentation. Select New option it it to open New presentation dialog box. Click Blank presentation option under the Blank and recent section. A Blank presentation is started with a blank slide inserted in it. 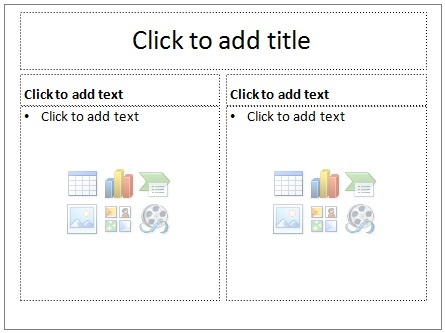 The default layout of this slide is Title Slide which can be changed using slides group under the Home tab by clicking layout drop list button. Click in the title placeholder and type the word COMPUTER inside the text box. Now click inside the subtitle placeholder and type your name with a heading created By. Now click outside the text box to remove the placeholder. your first slide is ready now.
) drop button in the Slides group available under Home Tab to get various other types of slide layouts in the expanded list. Click the layout that you want for your slide. Just follow the instructions written in the placeholders to use them for making your slide. If it is a text placeholder, you will get an insertion point inside the box to type your text. After typing the text, click outside the text placeholder. The rectangular box will disappear leaving the text at that position. A Placeholder is a dotted rectangular box on the slide that can hold text, graphics, tables, etc. 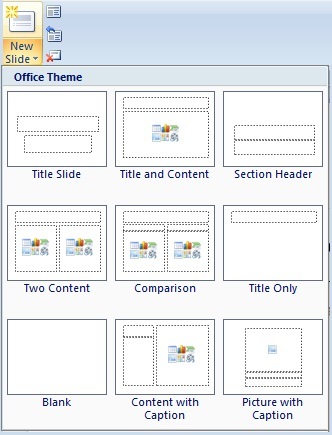 Microsoft Powerpoint has predesigned themes in it, called Design Templates, that you can use for your presentation. There are various types of design templates which can give your specific design concept, font colour scheme, etc. to your slides. Click on Installed Theme in the upper left corner. templates loaded on your computer appear in the new presentation dialog box. Double click a template that you would like to apply. The selected template will be applied to the current presentation. Open the presentation and select the slide whose theme is to be changed. 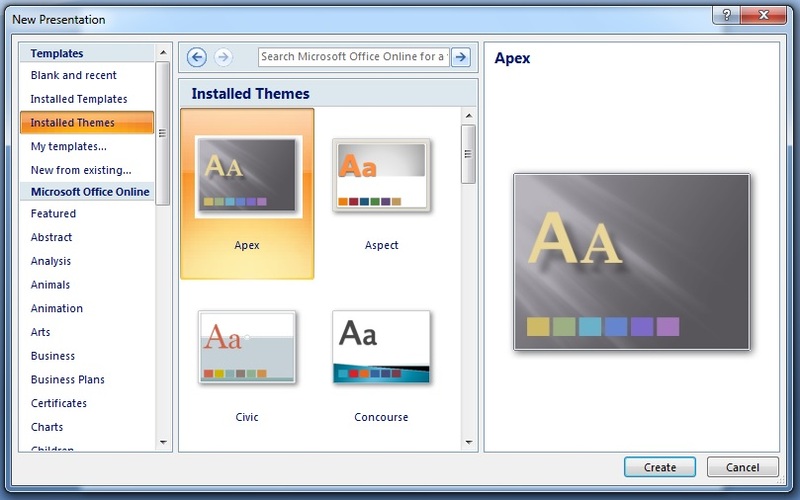 Select the new theme for your presentation from the Themes group by clicking on it. The selected design will appear on the slide. To apply the new theme on all the presentation slides, right-click on the selected theme in the Themes group and choose the option Apply to All Slides. After completing the first slide of your Presentation, you have to insert a new blank slide in the presentation to create the next slide. Click the New Slide () Button in the Slide group under Home Tab. A list of blank slide layouts appear. Click the required slide layout (For example, two contents) in the list. A new slide will appear in the slide pane area along with required placeholders. Now click in the title placeholder and type the heading what is Computer? 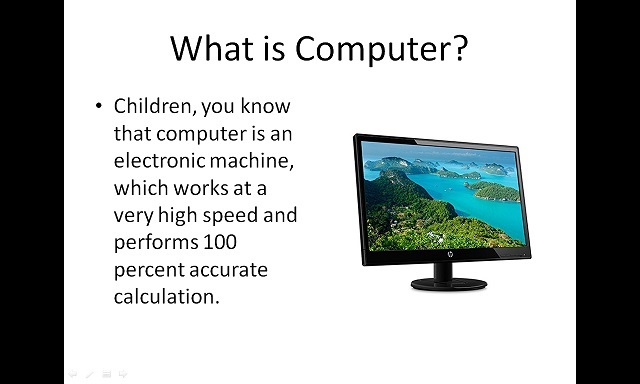 Click one of the text box below the title and type the definition of computer. To insert the Clip-art picture of computer, click the Clip Art() icon in the placeholder. A Clip Art task pane will appear. Select the Clip Art of a Computer and click Ok button to place that Clip Art on your slide. Name any two objects other than Clip Art which can be inserted on the slide using Placeholders. Saving a Presentation means saving all the slides of that presentation together as a single file. 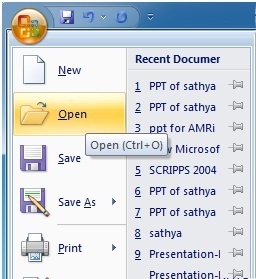 Select Save As option in the Microsoft Office button menu. Save As dialog box appears. Type the name of your Presentation in the File name box. You can also save your presentation by pressing Ctrl+S. Select Open option from the Microsoft Office button menu. Open dialog box will display on the screen. Select your file from the list displayed in the open dialog box. Select the close option from the Microsoft Office button menu. You will be asked to save your Presentation in case you have not saved it. Click Yes to save your Presentation, No if you don’t want to save and Cancel if you still want to work with the Presentation. 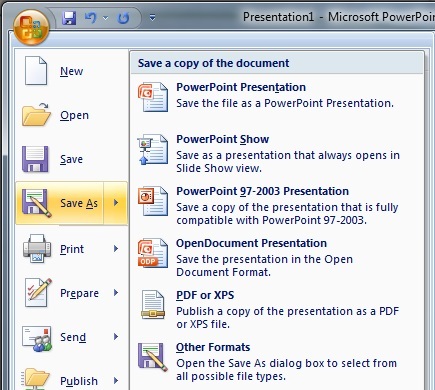 Click Exit PowerPoint button in the Microsoft Office button menu. You will be asked to save your Presentation if not saved. Click the appropriate button to close PowerPoint. You can also close PowerPoint by pressing Alt +F4 from the keyboard. By now, you know how to create a Presentation. Now, You will see all your slides one-by-one on full monitor screen. 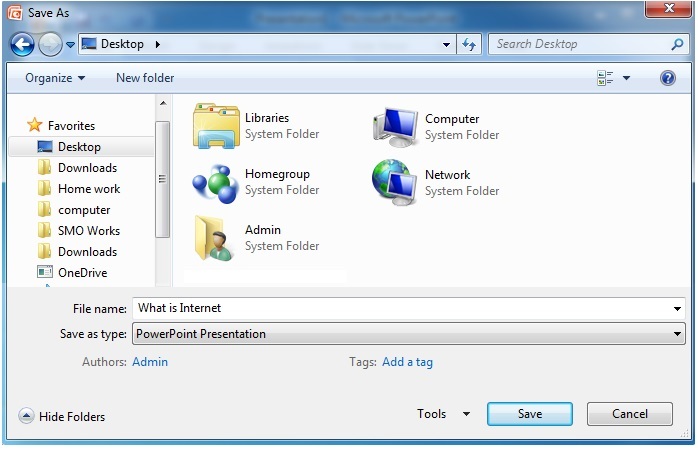 Powerpoint gives you the option to display all the slides one-by-one sequentially on full screen. This process is called Slide Show. Click the Slideshow tab on the ribbon and click From Beginning button from the Start Slide Show group. Press F5 key on the keyboard. Press the Slide Show view() button on the Status bar. Your first slide will appear on full screen mode. Press the Enter key on the keyboard or click left mouse button to bring the next slide on the Screen. Continue like this till the end of the Presentation. 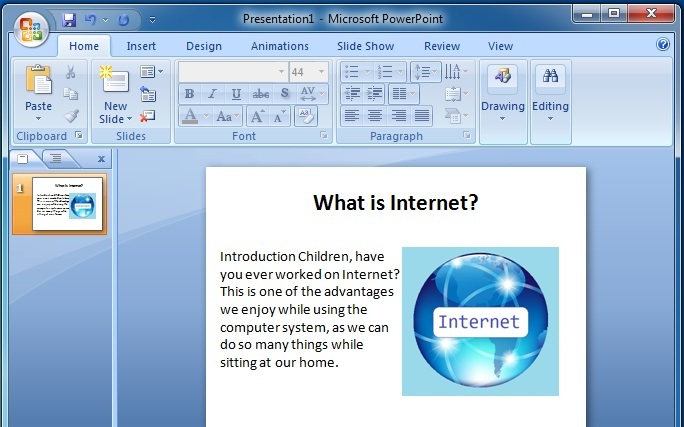 Microsoft PowerPoint is used to create computerized Presentation. A presentation is a systematic way to display information in the form of slides. Slides are the individual pages of a Presentation. We can create, modify or design our Presentation in Normal view. Placeholder is a dotted rectangular box on the slide which is used to hold text, graphics or other slide objects. 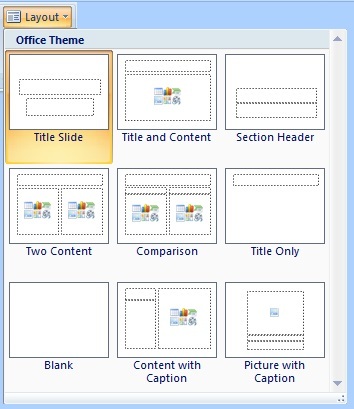 Various Slide layouts present in Microsoft PowerPoint allow us to Systematically place the title, text, graphics or other objects on the slide.